A 90s pop icon well-versed in teenage masochism and the limbo we call coming-of-age (apparently it’s located in Arizona) once sang, “Gimme, gimme more. Gimme. 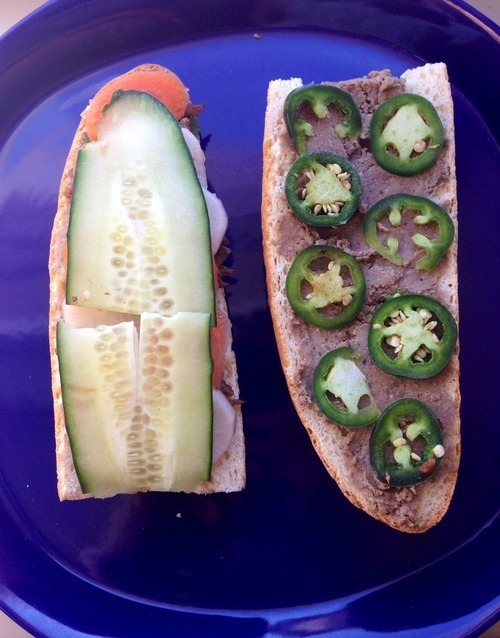 Gimme, gimme more.” This mantra really resonates with me, particularly when it comes to sandwiches, sandwich-like foods, and the noble banh mi. Limited too, Hit Clips, and throngs of frosted haired pop groups may be relics of the past, but Britney still gets me. Back to sandwiches. I normally avoid new years resolutions, but I hopped on the bandwagon this year and promised myself I would eat more sandwiches, make more sandwiches, buy more sandwiches, and write more sandwich recipes in 2015. If a resolution I must make, let it be magnificent. And related to food. 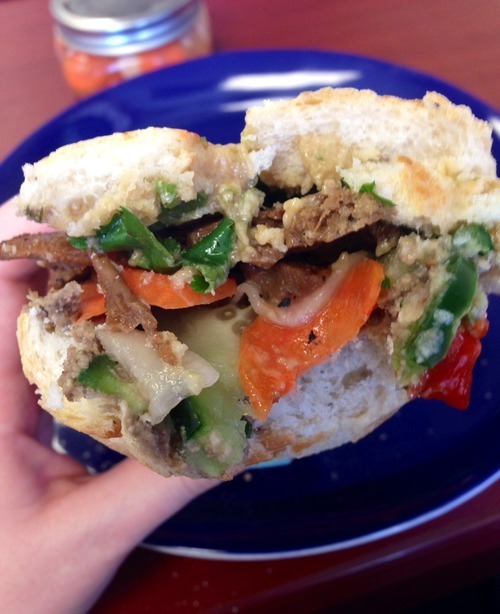 Sandwiches are wonderful things. You can easily modify them to your taste. Flat, carby shapes like bread are always involved. They’re portable. They make you look super cool. Kitchen idiots can make them. Kitchen wizards can make them. My cat won’t try to eat them. You know what is not so wonderful about sandwiches? Call it a burger, wrap, pb & j, sammie, hoagie, sub, panini—no matter what, the lettuce and tomato fall off, the spread drips out the sides, sauces leak and trickle down your hands, the bread falls apart under the weight and density of so many ingredients…all after the first couple of bites. Inevitably you get a mouthful of naked bread, or of select filling. Do you know how emotionally tumultuous that is? I’ve spent many a lunch just stuffing sandwich ingredients in my mouth, one at a time, to avoid the inevitable sandwich disintegration. It makes my coworkers very uncomfortable. 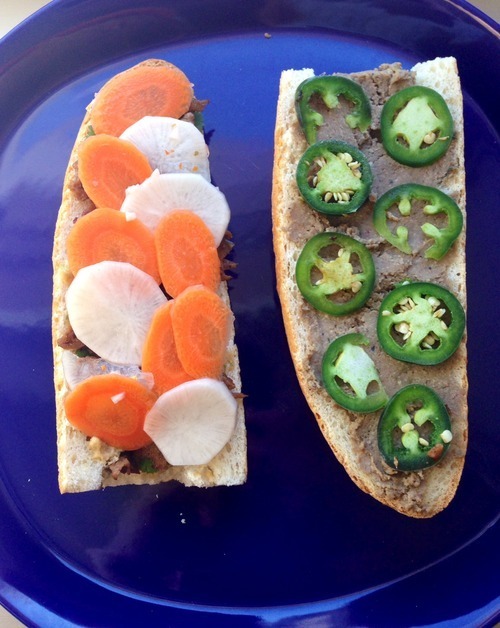 So, 2015 sandwich recipe #1: the reinforced banh mi. Tangy, filling, and definitely not authentic. The trick is to carve out the baguette and thinly slice ingredients to reduce spillage, instead of shredding everything. The banh mi requires several components, and I highly recommend starting the food making process the day before you assemble your banh mi. I also provide alternatives to each component. Your tongue isn’t the same as mine, and neither is your kitchen. Slice the carrot and daikon as thinly as you can. Mince the garlic. 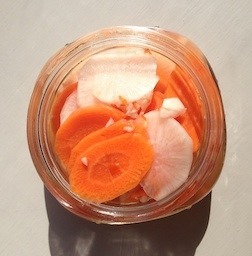 In a small mixing bowl add the sliced daikon, carrot, garlic, umeboshi vinegar, water, and chili flake. Mix well and refrigerate in an airtight container overnight. Alternatives: shred the carrot and daikon. Throw in the cucumber if you prefer it pickled to fresh on the sandwich. Bring the vegan butter to room temperature. Slice the white and green parts of the scallion. Whisk the butter, miso, hoisin, and scallion with a fork in a small bowl. Store in an airtight container in the fridge. Alternatives: Use a vegan mayo instead of butter. Use cilantro or basil instead of scallion. Try soy sauce or vegetarian oyster sauce instead of hoisin. Bring 1.5 c water to a boil. Salt the water. Add the lentils and cook for 20 minutes, or until tender. Roughly slice the scallions, separate the green and white parts, and fry the white parts in 1 tsp of olive oil over medium heat for 5 minutes. Add the green parts and fry for an additional minute. Now add all of the ingredients to a food processor, add salt and pepper to taste, and blend until smooth. Store in an airtight container overnight. Alternatives: use ume OR rice vinegar if you don’t have both (ume is sweeter). I like the combo of flavors, which is why I use both in this recipe. You can substitute 1-2 tsp lime juice for the tamarind concentrate. 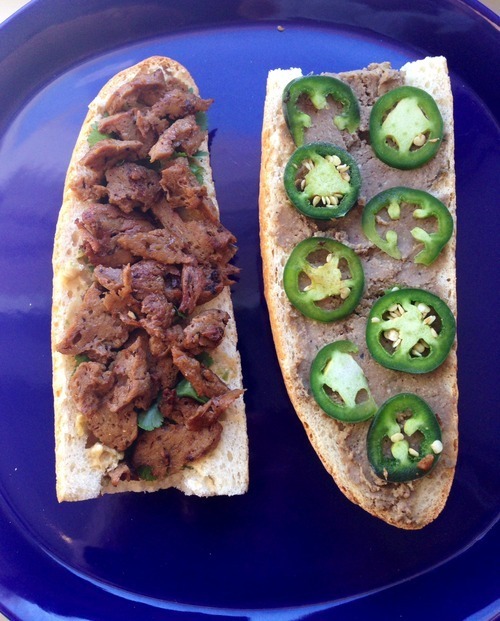 Slice the seitan so it looks like shredded meat. Mince the ginger and thinly slice the lemongrass. Put all of the ingredients in a ziploc bag, close it, and shake to evenly distribute the flavors. Let it marinate in the fridge overnight. After marinating, heat up the oil in a frying pan and dump the bag of seitan in there. 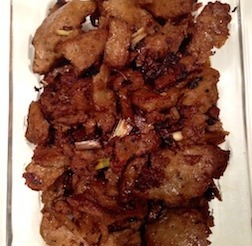 Agitating regularly, fry the seitan until it’s browned and crispy. Alternatives: If you don’t have fresh lemongrass, get jarred stuff like this. Olive, sunflower, palm, or coconut oil works with this recipe. Use any liquid sweetener as an alternative to maple syrup. You can get away with marinating for only 6 hours. For the fixins: Thinly slice the jalapeño. Thinly slice the cucumber, vertically. Slice the baguette. Carve out the middle of the baguette. 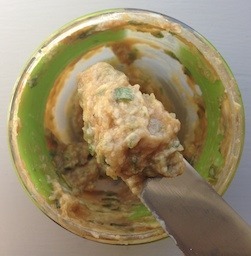 Spread buddha butter on one half, pâté on the other half. 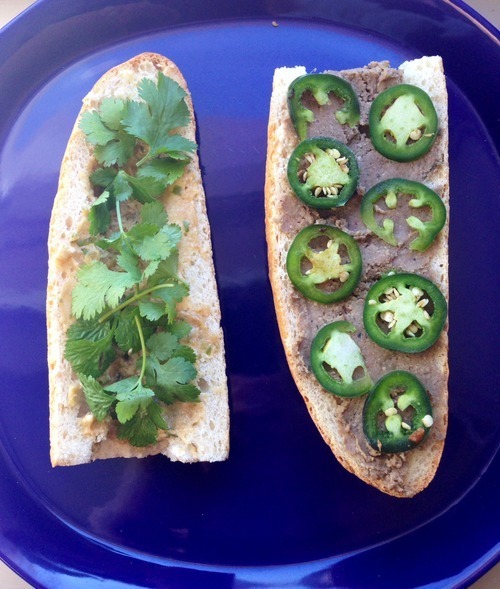 Add sliced jalapeño and sprigs of cilantro. Add some crispy, absurdly delicious seitan. Top with sliced cucumber, basil, and mint. Version 1: I used ¼ of a regular baguette and no herbs. 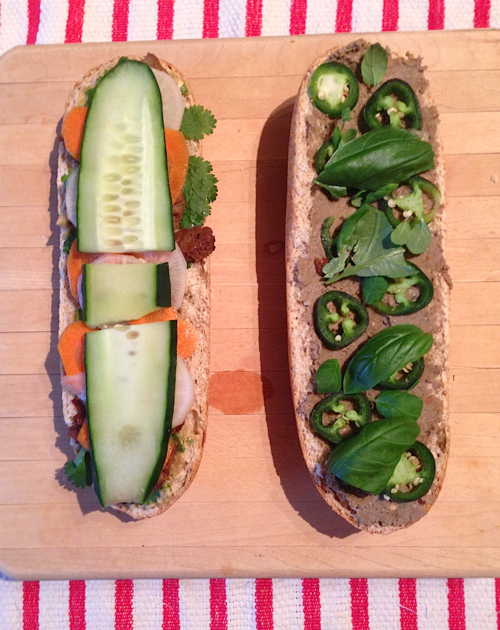 Version 2: I used a medium, whole wheat baguette and included herbs. Get addicted. Pretend like it’s 1998 and you’re still relevant. Sandwich dipping sauce for extra sugar/salt/spice: 50/50 hoisin and sriracha. I will reiterate: carve out some of the inner baguette. The gain is twofold. More room for fixins, less room for spillage. Sandwich spillage makes me rage. MARINATE. The veggies and the seitan need to marinate. 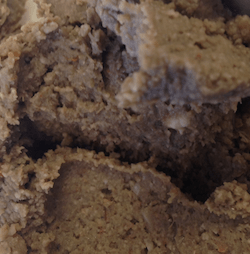 The pâté flavors need to mingle overnight in the fridge. It’s a worth-the-wait process, and this is coming from someone who eats food cold because the microwave takes too long. 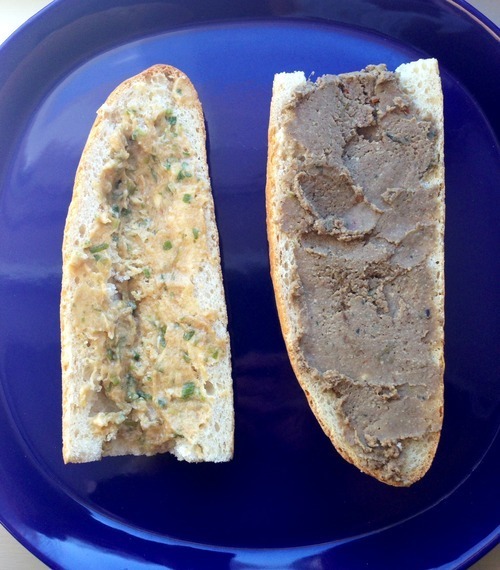 There’s no denying it, the lentil pâté looks exactly like wet cat food. Looks aside, this stuff is delicious and versatile. I slather it on all types of sandwiches, dip it like hummus, and eat it with a spoon.